If you’re traveling light on your next vacation adventure this is definitely not the Swiss Army knife to bring with you. 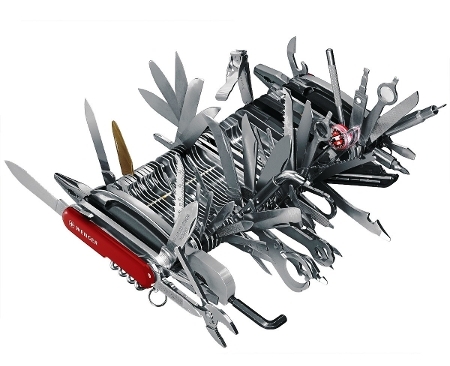 In fact, you probably don’t want to bring this Swiss Army Knife anywhere at all. Maybe just keep it in a very sturdy drawer, or set it on your coffee table as a conversation piece. Because this my friends is the mother of all Swiss Army knives. Called the Wenger 16999 Swiss Army Knife Giant, this Swiss Army knife weighs an insane 7 pounds, is 8 inches wide, and probably has more tools than you have in your toolbox. Along with the normal things you’d expect a Swiss Army knife to have, the Wenger 16999 Giant has accessories that will make you lol. Mineral crystal magnifier, fiber optic tool holder, club face cleaner. And if you ever need a tire tread gauge the Wenger 16999 Giant has it, though I have pity for anyone who lets this monstrosity of a Swiss Army knife around their tires. 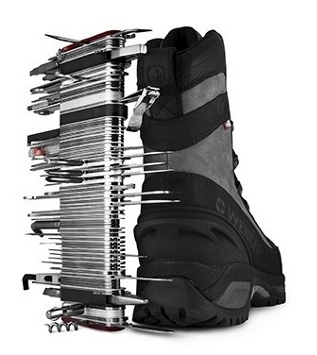 It’s interesting to imagine someone hauling this unwieldy monster of a Swiss Army knife out and trying to use it when they need a screwdriver or something… though come to think of it that would make a hilarious prank. Er, hilarious but expensive since it sells for over $1,000. But hey then you’d have the giant paperweight you’ve always wanted :D.
I just thought of another use for the Wegner 16999 Giant, you could lug it over to the nightstand, set it on it’s side, and use it as a travel alarm clock. Oh wait…strangely…it doesn’t have an alarm clock. That’s too bad, you think they’d have found room for one somewhere between the watch case back opening tool and the compass. 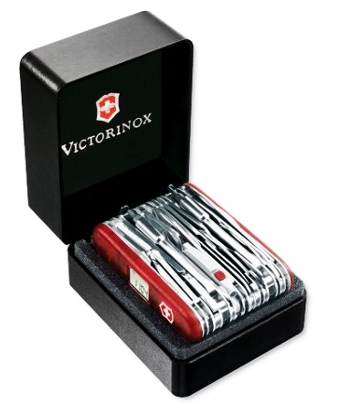 But if you really have your heart set on a Swiss Army knife travel alarm clock then you could go for the slightly less ridiculous Victorinox SwissChamp XAVT. It not only has an alarm clock but also an altimeter, thermometer, pruning blade, and sewing eye. While not as ginormous as the Wengner Giant, the Victorinox SwissChamp is still quite hefty with it’s 80 tools and seems like it would be pretty darn inconvenient to use. I must be wrong though, because they sell a leather carrying pouch for the SwissChamp so more than a few people out there have got to be traveling with it! I’d like to see that in action haha. Amazing! I have heard they also have a new giant knife that includes a detachable flash drive and sells for $3,000. That’s really interesting, do you happen to know the model name? The only $3,000 one from them I could find was, incredibly, simply a 1TB hard drive and a basic Swiss Army knife setup.